San Clemente takes pride in its beautiful Casa Romantica Cultural Center that sits high on a cliff above a magnificent ocean view. But in the late 1990s the structure came close to being razed and replaced by condos, or worse yet, turned into yet another Mexican restaurant - just a few of the plans submitted to city officials who pondered the crumbling Casa’s future. 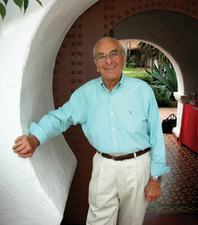 Guy Varriano, and his wife, Terry, moved to San Clemente in 1998. “After I’d been here about a year, I told myself I ought to be doing something good for the community. It was about then that Wayne Eggleston, Executive director of the Heritage Foundation of San Clemente, and a few others, said, ‘No way!’ to the commercial developer plans for the Casa. “Wayne, whom I did volunteer work with at the Heritage Museum and Visitor Center, asked me to join their Casa effort. That was my first involvement here, and right afterwards I went through the City Leadership Program. “When I worked inside the Heritage Center building, people from all over the country would stop in there and one of the first things they’d ask me is, ‘Where is your cultural center?’ And when I’d say, ‘We don’t have one,’ they couldn’t believe it. So, I began thinking, what an opportunity to do something for the community, that will last forever, and that is what motivated me to get involved with the Casa. “When the Heritage Center closed, I was asked by the City of San Clemente to be on the steering committee to recommend to the council whether we should develop the Casa Romantica into a cultural center. “I spent a year on that committee completing a feasibility study with Wolf Keens and Company, and during that time, the city received $1,250,000 from the Orange County Community Foundation, in donation and seed money, towards restoration of the Casa. In light of that, our recommendation to the city council in September of 1999 was yes, that we should develop the Casa Romantica into a cultural center. “About then I got a call from the city saying that they’d like me to be on the Casa Romantica Board of Directors. I told them that I was just new to town and turned them down twice, but they knew my community service background and were insistent. Finally, Wayne, who was on city counsel at the time, took me out to lunch and said, ‘We need you,’ and so I accepted. Our goal was to raise $3 million more towards Casa renovation.” As a Casa Board Trustee, Varriano is one of the founders of the Toast To the Casa. The Casa Romantica Board raised over $3 million during their initial campaign fund drive and continues to develop operating funds through special events, naming opportunities, and memberships to fund its operation. In other local community work, in August 2001, Varriano founded the annual, and hugely successful, Our Lady of Fatima Knights of Columbus BBQ Tri-tip sandwich fundraiser at the Fiesta, held in front of Billy’s Deli. Since July 2004, he has been the Public Relations Director for the San Clemente Sunrise Rotary. Guy Varriano was not new to community service when he and wife, Terry, moved here, after living 28 years in Atherton, California. While there, he was Park and Recreation Commissioner, President of the Holbrook Palmer Park Foundation (to develop a 22 acre bequeath of prime land into a community park, plus renovate three historical homes), Chief Financial Officer of the Atherton Civic Interest League, Atherton Citizen of the Year for 1998 and recipient of a Special Congressional Recognition from the U.S. House of Representatives for outstanding and valuable service to the community. His neighbors in this exclusive bedroom community of 6,000 included Joe Montana, Barry Bonds, Charles Schwab, Meg Whitman, Willy Mays, Ty Cobb, Jerry Rice and several rock stars including Lindsey Buckingham, of Fleetwood Mac. Raised there, Varriano served in the U.S. Navy, earned his business degree in only 2.5 years at Seattle University and did post-grad work at Stanford in foreign study. He served in corporate life for 38 years, ending as a Senior VP with Household International, now HSBC, one of the largest banks in the world. When he retired at age 63, he oversaw ten states, a thousand employees and 100 branch offices.